In recognition of the winter descending upon us, Chris requested soup for lunch on Saturday. 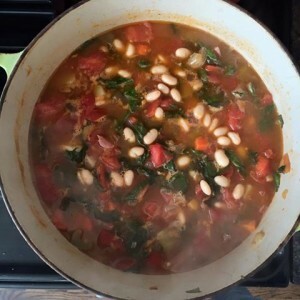 A big pot of homemade Minestrone did the trick. Loaded with hearty winter vegetables, it warmed us up, body and soul! Heat a heavy stock pot over medium heat and add a few good swirls of olive oil. Toss in carrots, celery, onion and procuitto. Cook 8-10 minutes, until the onions start to soften. Add garlic and cook for 2 minutes. Add potatoes and tomatoes, and cook for 10-15 minutes. Add broth and bring to a low boil. Add chard and beans and simmer until chard is wilted. Season generously with pepper. Salt to taste. Ladle into bowls and top with a good amount of freshly grated Parmesan cheese.